Pachistopelma rufonigrum Pocock, 1901 is a very stunning bird spider due to its patterns and coloration from Northeastern Brazil, from the state of Rio Grande do Norte to the state of Alagoas. The spider is mainly found in coastal regions and exclusively in bromeliads, which suggests a high dependency on bromeliads (Santos et al. 2004). Even more remarkable is the fact Pachistopelma rufonigrum inhabits bromeliads in Atlantic rainforests on rocky outcrops, which are exposed to direct and intense sunlight. A higher occupancy rate of bromeliads by Pachistopelma rufonigrum has been observed in xerophilous areas (Santos et al. 2004).  With a flat cephalic region and flatter abdomen, the spider is considered to be evolutionary adapted to its life in bromeliads. Pachistopelma rufonigrum shows interesting changes of colors and patterns throughout different developmental stages. Both male and female differ from other Aviculariinae, except for Ephebopus, Tapinauchenius and Psalmopoeus in the position of the first eye row. Different to these genera Pachistopelma rufonigrum is equipped with urticating setae type II, except for mature females. 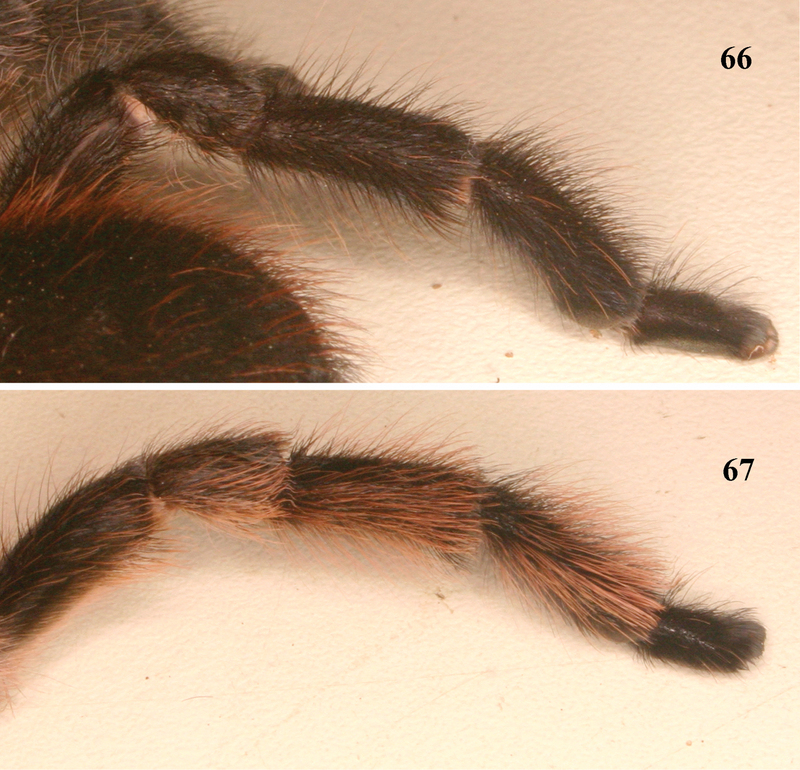 Since the revision by Bertani in 2012 Avicularia pulchra Mello-Leitão, 1933c and Avicularia recifiensis Struchen & Brändle, 1996 are considered to be junior-synonyms of Pachistopelma rufonigrum Pocock, 1901. Synonyms: Avicularia pulchra Mello-Leitão, 1933c, Avicularia recifiensis Struchen & Brändle, 1996. 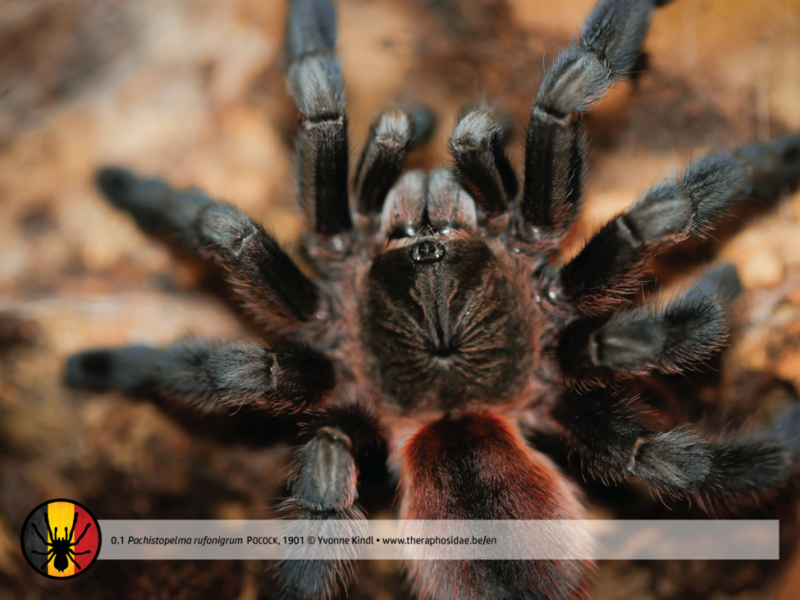 Previous names: Pachistopelma rufonigrum Pocock, 1901, Dolichothele scintillans de Mello-Leitão, 1929c, Avicularia pulchra Mello-Leitão, 1933c, Avicularia recifiensis Struchen & Brändle, 1996, Pachistopelma rufonigrum Peters, 2003, Avicularia recifiensis Schmidt, 2003I, Pachistopelma rufonigrum Peters, 2005a, Pachistopelma rufonigrum Bertani, 2012, Pachistopelma rufonigrum Cavallo & Ferretti, 2015. Type: Pachistopelma rufonigrum inhabits exclusively terrestrial bromeliads. You might consider this to be an arboreal lifestyle. Urticating setae: Yes (abdomen). Type II in immatures and males. Origin: Brazil, states of Rio Grande do Norte (Baia Formosa, Natal), Paraíba (Alhandra, Igarassú, Mamanguape), Pernambuco (Agrestina, Serra da Quitéria, Rio Formoso), Alagoas (Murici, Jitituba, Fazenda Santa Fé, Fazenda Santa Justina), mainly in coastal regions of very distinct area such as restinga, caatinga and Atlantic rainforests. Span width: ≤ 12-15cm probably. As hobby stock is quite young nowadays (2017), this remains a guess. Species described in the official papers were smaller. No total span width was mentioned. Life expectancy: No valuable source found. It is expected to be between 12-15 years. Behavior: The spider will try to flee at first. Persistent provocation can result in use of urticating setae. The spider inhabits exclusively bromeliads. However the species is mainly encountered living individually on 1 plant, in few cases 2 spiders were seen living on the same bromeliad. The spiders, however, were different of age (at least 1 immature) and no further interactions between the spiders were noticed. Pachistopelma rufonigrum is not an active hunter. She remains in the plant’s leaves for hours. When disturbed, spiders were seen diving in the phytotelma water. They stayed there for several minutes. Sexual dimorphism: Yes. Females are heavier than males and darker colored. Immatures and mature males have type II urticating setae on the abdomen, which becomes lost in adult females. Females and immatures have a very low cephalic region. Pachistopelma rufonigrum have been studied mostly in Estação Ecológica Serra de Itabaiana (state Sergipe). Vegetation of Estação Ecológica Serra de Itabaiana is composed of scattered shrubs, cactus, bromeliads and white sand soil. The spider was found in solely tank bromeliads of the Aechmea and Hohenbergia genus. Both types accumulate pluvial water inside their central tanks, which stands in contrast with the rather dry environment throughout the year. This thermoregulating mechanism provides a microclimate different to that of the external environment. Humidity levels are higher, while temperatures inside the plant are cooler than air-temperatures in the morning. This being said the plants are able to create a warmer environment inside the plant compared to air-temperatures outside in the evening. Temperature: 23-27°C (day), 21-23°C (night). * Be advised bromeliads help maintain a rather humid environment. Adult: LxWxH: 20x20x30. 2-3x span width in height. Smaller than adult: 2-3x span width in height. * Add a (preferably real) bromeliad in your set-up. If you don’t, big leaves are recommended in an arboreal set-up. Spray the leaves, if no bromeliad, on a daily basis. Smaller than adult: 1 span width. * Pachistopelma rufonigrum doesn’t always inhabit the bromeliad in captivity. As the spider have been noticed burrowing, a decent amount of substrate is advised. Wet season: April, May, June, July, August. Dry season: September, October, November, December, January, February, March. Esp. November, December and January are very dry. Warmest month: January, February, March, December (22-29°C). Coldest months: July, August (18-25°C). Click here or the picture to go to the source (2012). Breeding Pachistopelma rufonigrum is normally not that difficult. In contrast with other Aviculariinae, the female accepts the male’s presence for a very long time. • 2 months after mating the female will retreat inside a burrow. Females were noticed burrowing out of sight in captivity. • 2-3 months after mating the female will start making the cocoon. Deprive the cocoon, when desired, 4 weeks later. Store the eggs at a humidity of 80-90% and a temperature of 24-27°C. Expect the sac to be filled with 50-60 eggs. • You might consider to leave the cocoon with the mother until the spiderlings come out. • Pachistopelma rufonigrum inhabits exclusively bromeliads? • Pachistopelma rufonigrum inhabits mainly coastal regions? • The cephalic region in females and immature species is very low compared to mature males. It is supposed the low eye tubercle and the flattened body is an evolutionary adaptation to live in tank bromeliads? • It is supposed bromeliads serve Pachistopelma spp. by protecting them against predators and desiccation? 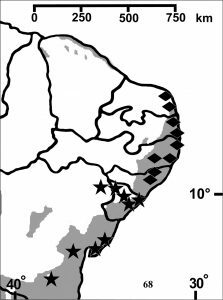 • The microhabitat inside bromeliads is different to hot and dry climate of the Serra de Itabaiana region? • Spiderlings of Pachistopelma rufonigrum are remarkably big for such a small spider? • Pachistopelma rufonigrum shows interesting changes of colors and patterns throughout different developmental stages? • Pachistopelma rufonigrum is easily distinguished from Pachistopelma bromelicolia by the slender metatarsi IV without stiff bristles and pinkish legs with black tarsi?